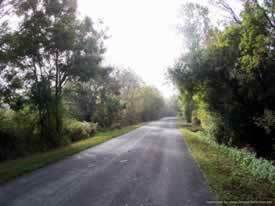 Reptiles and amphibians utilise roads for several reasons. For instance, they may be attempting to access resources on the opposite side of the road, to find mates, predating on species crossing roads or harnessing the heat from hot tarmac. The upper left photograph shows a road that bisects wooded wetland near the village of Chasnais that is frequently crossed by reptiles and amphibians. 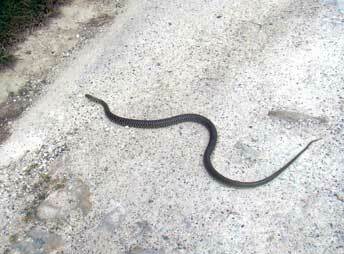 Examples of road activity are a road crossing subadult grass snake Natrix natrix (bottom left) and juvenile whip snake Hierophis viridiflavus (bottom right). Small snakes suffer higher road-kill than adults, partly due to their lower velocities and hence increased time on the road when crossing. 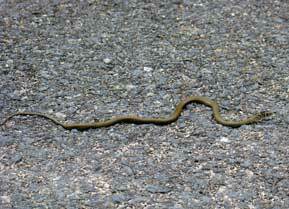 This increases the probability of a traffic encounter but during very hot weather juvenile grass and whip snakes were found suffering from thermal stress due to high tarmac temperatures. Green lizards Lacerta bilineata (top right) often bask on roads but also ambush road crossing insects. The individual shown is basking, as indicated by the flattened body posture that maximises heat uptake. Green lizards experience higher road-kill than the more common wall lizard, mostly due to basking and sentinel behaviour to predate road-crossing invertebrates. Wall lizards mainly forage along roadsides and edges although with occasional forays onto roads to capture prey. On roads that bisect wetlands/woodlands, the agile frog (Rana dalmatina) palmate newt (Lissotriton helveticus) and marbled newt (Triturus marmoratus) experience high mortalities especially during the migratory period (October to December). To examine whether snakes cross roads alongside particular types of roadside habitat, involves comparing the distributions of habitat related snake crossing points with the availability of roadside habitat. If crossing points are randomly distributed they will be in agreement with the distribution of roadside habitat. The results, indicated selection of habitat crossings in all 4 species - whip snakes, grass snakes viperine snakes and aspic viper (V. aspis – see photographs below left) whether based on roadside habitat frequency or snake abundance in roadside habitat. Both tests indicated woodland as especially favoured for road crossings. An example of a woodland crossing point is shown left. Greater than expected crossings were also indicated next to low-density urban areas. The reasons for this appear to concern distruptions to snake movement corridors (hedgerows) by open patches (garage forecourts, gardens without hedgerow borders etc) that represent high risk for movement. The French herpetologist Hubert Saint Girons found that in agricultural landscapes in western France, aspic vipers use hedgerows as movement corridors to reach patches of woodland. The vipers in the study locality crossed roads between such hedgerow bordered segments in less than expected frequencies - why leave the relative safety of the hedgerow to risk a road crossing? However such crossings do occur and one is shown in the middle photograph of an aspic viper crossing a gravel path between hedgerows taken by a young English girl, Caroline Harris, during September 2011. The lower left photograph shows a viper that had just completed a more typical road crossing between hedgerows that were interrupted by a house and open garden with no hedgerow border on one side and a woodland patch on the opposite side. Vipers and also viperine snakes tend to cross roads more frequently towards the latter part of the active year with the peak number of crossings in October. This most likely involves movement to hibernation dens. 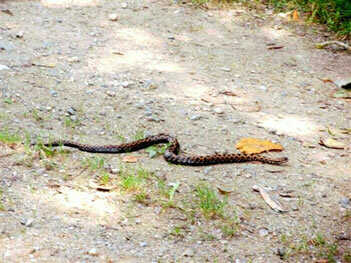 The above two photographs show examples of road crossing whip snakes. Above left shows a crossing during July when the weather was hot. The four species in the study usually crossed roads as quickly as possible and this individual was no exception and was moving at top speed. The snake above right was crossing during early December when the weather was cool (13C) and had a corresponding low body temperature. It may have been attempting to reach the winter hibernation den and was caught out by cold weather - it had been partially sunny earlier in the day. Testing for non-random snake road crossings. To evaluate if snakes cross roads at specific locations or at random points alongside roads a χ2 Goodness-of-fit test was used. This required constructing random models that produced patterns of expected probabilities. The proportions of different roadside habitat (linear measurements in metres) were used as the random model and then evaluated against the frequency of crossings alongside these habitats. The assumption was that if habitat proportions were in agreement with the distributions of road crossing points then crossings would be considered random; deviations from the null model an indication that crossing points were selected for. A second null model, that evaluates if snake numbers in roadside habitats influence crossing locations, was constructed using VEF (Visual Encounter Frequency)in each roadside habitat. In this test the null hypothesis is true when road crossings are in agreement with snake numbers in roadside habitat. 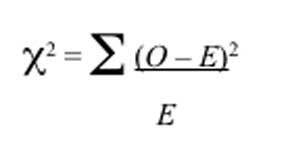 Where O is the observed and E the expected frequencies. The test is at n -1 d.f. for categories (not the sample size) and hence 5 major roadside habitat types gives d.f. = 4. The primary test against road side habitat proportions indicated that all four species crossed-roads alongside woodland in greater than expected numbers. The second test against snake numbers in roadside habitat supported this finding; crossings were greater than expected when compared to snake abundance in woodland at roadsides. The true χ2 values (in both sets of tests) for all four species were then subjected to Monte-Carlo randomisations, where the categorical frequencies were randomly reassigned 5000 times to produce simulated χ2 values. Significance levels were determined when 5% or less of the synthetic χ2 values equalled or exceeded the true χ2 statistics. All the randomisation tests supported the original findings. 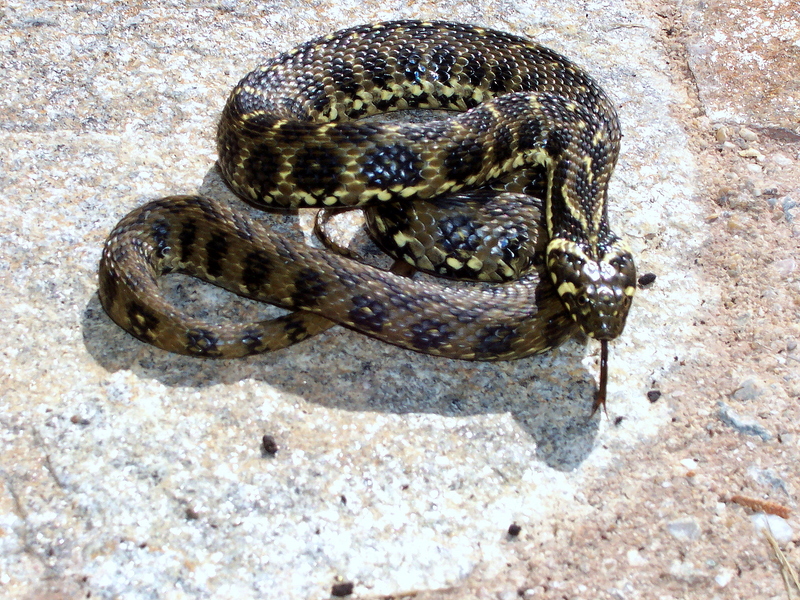 An example of how this works is shown below using the result for crossing points in relation to roadside abundance in the viperine snake (Natrix maura; photograph above). In this example the true χ2 gave 14.1 with p = 0.007. After 5000 randomisations only 45 of the synthetic χ2`s reached or exceeded this threshold, thus 45/5000 = 0.009; the true χ2 is reliable. 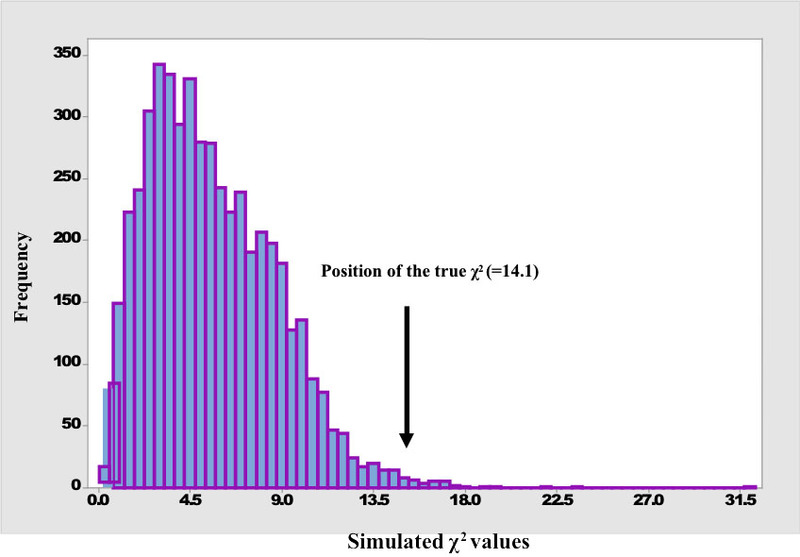 The graph below shows the location of the true χ2 in relation to the distribution of the synthetic χ2 `s. The synthetic values are heavily positively skewed (S = 0.79; median = 5.1) with the true χ2 sitting in the right tail of the distribution. Results of the Monte Carlo analysis comparing road crossing habitat locations in N. maura to the numbers of snakes in corresponding roadside habitat. The arrow indicates the location of the true χ2 statistic in relation to the distribution of 5000 synthetic χ2 values. The absence of random road crossings in snakes may originate from avoidance of open habitat in natural environments due to risk of predation (see Fitch, H.S. (1999): A Kansas Snake Sommunity: Composition and Changes over 50 years. 165 pp. Krieger Publishing, Melbourne, Florida.). Roads represent open habitat and hence selecting crossing points where there is a degree of cover may reduce predation risk, especially from raptors. The publications describing the full results of snakes and lizards on roads are available below. Lizards utilize roads in different ways to snakes. For instance, snakes generally avoid roads and cross only when they interrupt foraging movements, lizards, as well as using the warm tarmac to thermoregulate, feed on insects and other small invertebrates that cross roads including those that have been road-killed – e.g. crickets, butterflies and dragonflies. Wall lizards (Podarcis muralis) are primarily foragers and actively hunt insects whilst green lizards (Lacerta bilineata) are mainly sentinel predators that may wait for a road-crossing insect to come into view. There is some evidence from other studies that lizards also use roads as movement corridors to bypass dense impenetrable woodland. Lizard road-kill is in part due to an inability to estimate the speeds of vehicles, which may be too recent an event to evolve recognition and a behaviour response. 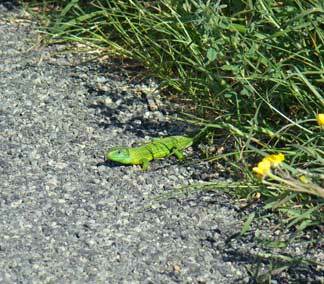 Below left shows a wall lizard photographed whilst foraging on a minor road edge in the village of St Denis-du-Payre. 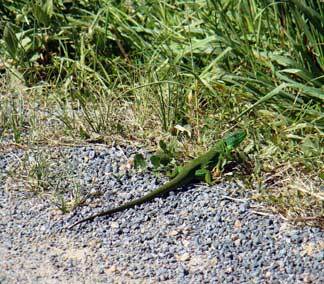 Below right shows a male green lizard at the road edge immediately after completing a road crossing. A pdf of the paper describing the full results for lizards can be found below. In the study locality hedgerows form a high proportion of roadside habitat and are used by lizards (and snakes) as corridors for movement, to find prey and mates. The photograph (left) shows a male green lizard basking in bramble bush bordering the D127 between the villages of Chasnais and Triaize. Amphibian road mortalities differ from those of reptiles due to differences in ecology and behaviour. In the study locality the highest reptile mortalities have generally been found on the roads with highest traffic volumes but in amphibians they are mostly habitat associated – reflecting the amphibian requirement for moist habitats. Furthermore, many amphibians have a migratory season during which they may travel substantial distances to reach breeding ponds or summer home ranges. This results in mortalities usually occurring within limited time frames. In the Vendee most amphibian casualties were found on roads that bisect wooded areas that flood during the winter months (photographs below). Several species are active in these habitats throughout the winter if temperatures permit. The mean monthly air temperature between November and February is 10.2˚C, which is within the operative temperature for newts (Triturus and Lissotriton) and some anurans e.g. common toad, Bufo bufo. The migratory periods commence October peaking during November and December but may last until January depending on climatic conditions. These are the months when most road mortalities occur. 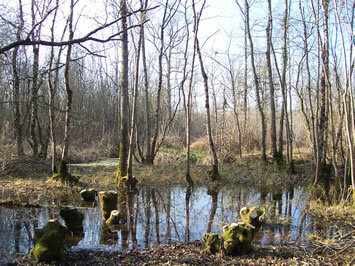 Dry summer woodland becomes a wetland during late autumn and winter providing habitat for amphibians. 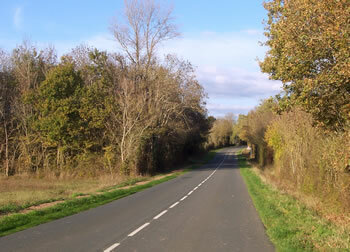 The top left photograph shows one of two roads (rue de Bourneau) that bisect the woodland shown lower left. The photograph was taken on a damp morning after overnight rain during late November (2011) when six of the seven known amphibian species were recorded as road-kill on this short road segment. This included tree frogs (Hyla arborea), crested newt (Triturus cristatus) and marbled newt (T. marmoratus). The lower photograph of the adjacent woodland was taken in late February when most amphibians were already present in the breeding ponds either as hibernators at the bottom of ponds (e.g. Pelophylax lessonae) or active in the ponds, which is the three newt species. Others usually hibernate in terrestrial areas close by (e.g. Bufo bufo). During these months road mortalities are low since activity is limited either to short distance terrestrial activity or confined to activity in ponds in most species. 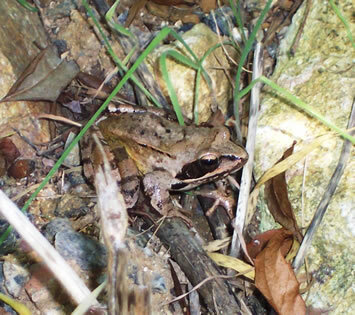 Road mortalities in the agile frog (Rana dalmatina) show temporal differences with other amphibians in the study locality. For instance mortalities are high during summer months from July and continue to be high until November into early December. This is partly due to a foraging lifestyle in the summer months (wet weather does not appear to be a requirement for activity in this species) both nocturnally and diurnally. As a consequence mortalities can be found on rue de Bourneau throughout the year. 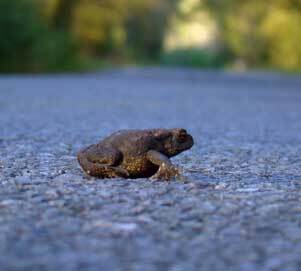 The photograph above left shows an unusual event, a road crossing common toad seen during daylight hours, in this instance at around 1700hrs. Reptile and Amphibian Mortalities Compared. 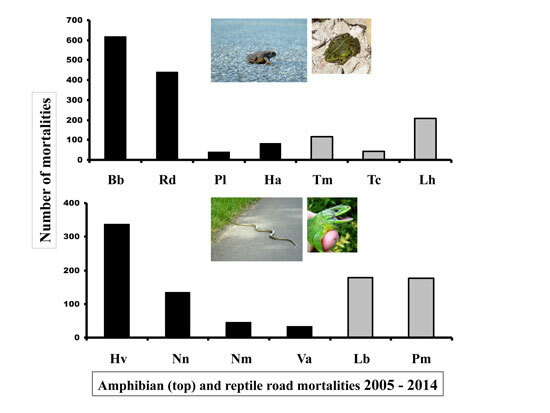 The graph below shows total mortalities recorded over a 10-year period and illustrates the higher amphibian casualties, partly due to their greater abundance but also slower movement and hence a tendency to be on roads for longer. This increases risk of contact with vehicles. Importantly, amphibian migration between breeding areas and summer home ranges results in large numbers crossing roads within relatively short time periods. However, in both groups the species that generally experience the highest mortalities are those that cover the greatest distances during activity. For reptiles this is the western whip snake (H. viridiflavus); for amphibians the common toad (B. bufo) and agile frog (R. dalmatina). Lizards tend to use roads as a resource, basking, feeding etc and suffer relatively high vehicle collisions as a consequence. Keys for the amphibian graph:- Solid histograms are the anurans Bb, Bufo bufo, Rd, Rana dalmatina, Pl, Pelophylax lessonae, Ha, Hyla arborea. Grey histograms are urodeles Tm Triturus marmoratus, Tc Triturus cristatus, Lh Lissotriton helveticus. For reptiles:- solid histograms are snakes Hv, Heirophis viridiflavus, Nn, Natrix natrix, Nm, Natrix maura, Va, Vipera aspis. Grey histograms are lizards Lb, Lacerta bilineata, Pm, Podarcis muralis.